She runs a tight command 5 piece costume includes hat, short sleeve shrug, halter top, tie and high waisted capris. 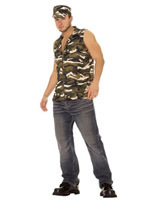 This army man is always at attention 2 piece costume includes zip front sleeveless shirt and hat. She'll have you standing at attention in this 3 piece costume that includes dress, shrug and hat. She'll salute you and seduce you in this 5 piece costume that includes dress, shrug, tie, belt and hat. She's always ready to go behind enemy lines 4 piece costume includes mini dress with pleated skirt, a bullet belt, dog tags and helmet. Shown with hosiery #1722. She'll have you standing at attention in this 3 piece costume that includes dress, gloves and hat. Mouth to mouth is her specialty 3 piece costume includes hat, stethoscope and dress with attached garters. T.L.C. after dark 5 piece costume includes head piece, arm band, dress, belt and leg garter. (Black light receptive).